So, a few things from the documents. These are the two best links. I'll just be posting various observations and such here. NAHSRG is a holding company, and there will be 2 sub-companies for the HSR and real estate, respectively. The leader of the HSR one is apparently a recognizable and "credible" leader. As it turns out, MnDOT had that staff and budget when Tom Sorel was Commissioner. When I googled him, I found this "press release" from about a month ago with the same, although more detailed, description. (Idk what the website is, but it's been registered since 1999). As I noted, the email came far before this release, so it isn't like they just found that description of Tom Sorel on google like I did. So allegedly Tom Sorel would lead their rail operations. According to the engineering consultant, there was a second group that indicated interest in the route (that we know wayyy less about). 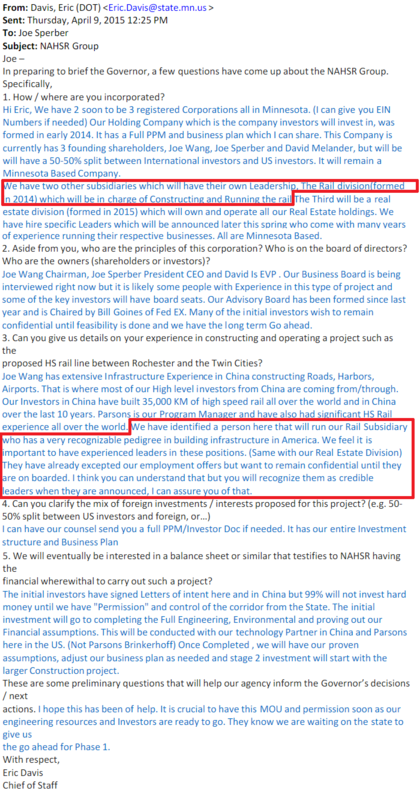 Additionally, building HSR trainset manufacturing capacity in Minnesota is planned. In another email from that consultant, one can see some of the informal governent approval from "Stage 1" in the business plan. 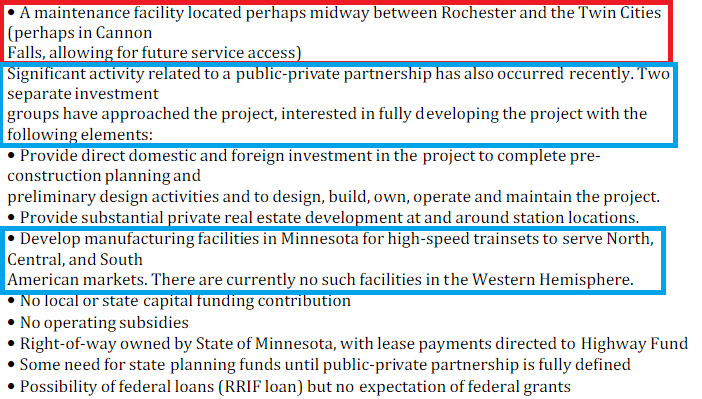 More interestingly, it says: "Total private sector investment is $8-$10 billion including rail, stations, and significant other development in both the Twin Cities, Cannon Falls and Rochester." This may be a bit speculative, but given the circumstances, I think that the real estate investment sub-company may be the vehicle for a lot of the expected non-mayo private-sector DMC investment. The DMC and Zip Rail investment numbers, together, give that "$8-$10 billion". This rail line won't be profitable on its own, yet is crucial for the DMC project (and related things like the 2023 expo); paying for the rail line using the positive externalities it generates makes sense, and is what this plan would do. One more circumstantial thing that I recall reading (found it!) was that the CTIB would fund 80% of a Riverview LRT line. While the "east metro wanting transit equity" thing does probably apply, there are also 4 other east metro corridors in the works, and yet it is Riverview, connecting St Paul to the South Loop, that CTIB really wants to happen, almost as if they possessed some kind of insider-information that made its way through governing circles and some of the legislature. A bit more speculation, but after reading through the emails (and with prior knowledge), I have a guess as to what happened this year. It looks like between the mess of the transportation bill (and lack thereof), the DMC loophole that had to be closed, Rep. Drazkowski's attempts to interfere with the Zip Rail project, the rest of the chaotic session (last-minute bill-passing anyone? ), and politcal concerns about the next election, the formal public acceptance/permission for this project didn't quite happen as it was supposed to. A private company seeking to build an elevated high-speed rail line from Rochester to the Twin Cities has withdrawn a request for exclusive air rights above state highways and is instead seeking a permit to allow for preliminary study of the rail line. The North American High Speed Rail Group is seeking a right-of-way permit from the Minnesota Department of Transportation. Company spokeswoman Wendy Meadley said that permit would allow the company to complete a preliminary study to determine whether the rail project is feasible. 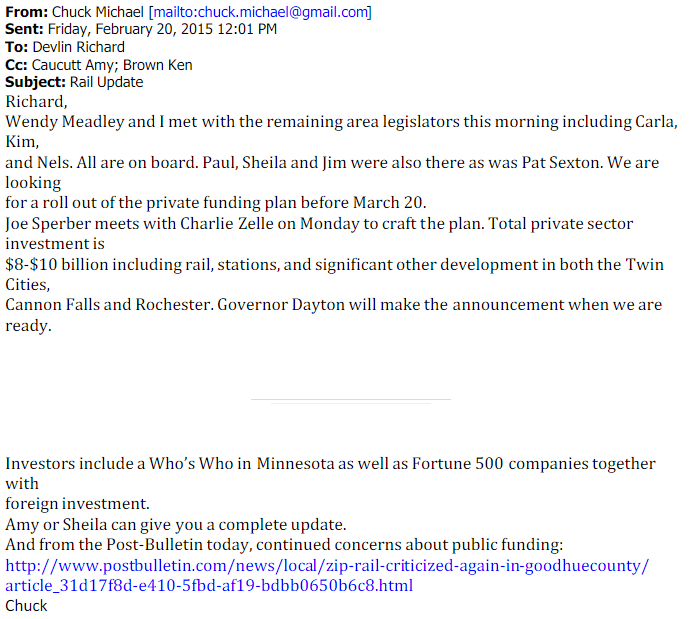 Since this popped up online, I'll post it -- there will be TAC and CAC meetings for Zip Rail on January 28th. They are open to the public to observe, but discussion is limited to committee members. The CCARL group is also having a meeting on February 4th. Nothing really new that we didn't already know. Same alternatives carried forward that we saw earlier. And also as expected, MNDOT is "hitting the pause button" on planning for this. I very much doubt this will ever get built now. Any effort to "restart" the process will undoubtedly be fought by the rural podunks and without it being much further along there is no way it would be eligible for funding even if there was money available. Which, ironically, is why they are pausing planning. Nobody at the state level is going to propose money to build a project that is so conceptual either. Great way for MNDOT to kill a project without getting its hands dirty. It's either consortium or bust IMO. The private company, Bloomington-based North American High Speed Rail Group, just received permits from MnDOT to study a possible high-speed rail project of its own. Get a glimpse of High Speed Rail landscape globally, including China, and in the United States and learn how and why Minnesota can truly become a leader in this emerging industry.This is the moment for Privately-funded High Speed Rail to be "Born" in Minnesota from translated Chinese or other global technologies. For those who don't want to do the incognito trick, here are some quotes. At Tuesday's meeting, County Administrator Richard Devlin praised the county leadership for pursuing the opportunity. There was public money available, interest in the community and a practical course to proceed, Devlin said. Those conditions have all but evaporated. "Today, I must say that the Governor's Office has been kind of tepid at best on this high-speed rail. The Legislature has actually been doing the opposite — trying to kill it. Mayo (Clinic) pays no attention to it. We're dead in the water. Really honestly, we're dead in the water," Devlin said. Devlin said he hoped to see the rail connection become a reality, likely as part of a larger connection between Minneapolis and Chicago. 'Very honestly, I hope as an elder in this community now, that sometime, someday, there will be a high speed rail between Minneapolis and Chicago and that Rochester will be a focal point for that," Devlin said. It needs to be done someday but I can understand if now is not the best time, given the economic environment. In one caption he mistakenly states that there are 34k MSP-Rochester commuters daily (he later correctly states that that number includes all non-Rochester commuters). The number I generally hear from MSP-Rochester by 52 is 4-5k daily. MinnPostRePost of the Adam Platt TCB article. Now with comments. "[Goodhue County is] a fairly densely populated county." Compared to what? Red Lake County? lol! The company also wants to incorporate freight into its plan and is considering building four stations along the line, in addition to a maintenance facility The ultimate goal remains extending the rail line to Chicago. . . . Medley said the preliminary study has not turned up any roadblocks to the project. the company is looking to move to phase two- raising up to $50 million from US investors to fund a detailed feasibility study. As a Bloomington resident it would be great to have a high speed rail terminal in our town with easy access to the Mall of America and MSP Airport. From a transit planning perspective however it just doesn't seem right to stop just short of either downtowns. While I assume there would be an easy transfer to the Blue Line to get to downtown, that still adds a lot of time to the travel. And assuming other regional rail projects will be built, it doesn't make sense to not incorporate this into one of the passenger rail hubs (Target Field or Union Depot). Accessing Target Field may be too challenging since there are no existing rail connections from that area to Minneapolis, and while there is an abandoned right-of-way between Mendota and Minneapolis, that is part of Minnehaha Park and the Blue Line so it would be virtually impossible to get high speed rail through there. There are a few ways of getting to St. Paul Union Depot, which is why it should go there, but also have a station across the river from MSP Airport with a shuttle bus to the terminals and MOA. It seems to me like a future taxpayer project to extend it from MSP > St Paul > Minneapolis > St Cloud. Until then the Blue Line and Riverview will have to do. The delegation will include six to 10 individuals from China, including representatives of the China-owned rail corporation. Also with company leaders will be technical experts and individuals responsible for overseeing sovereign funds. The group is slated to arrive on Monday and will spend the week attending private meetings with business and civic leaders, along with possible investors, according to Wang. Those meetings will happen in locations from the Twin Cities to Rochester.